The Hornets entered the night needing a win and a Detroit loss to the New York Knicks to clinch the final playoff spot in the East. 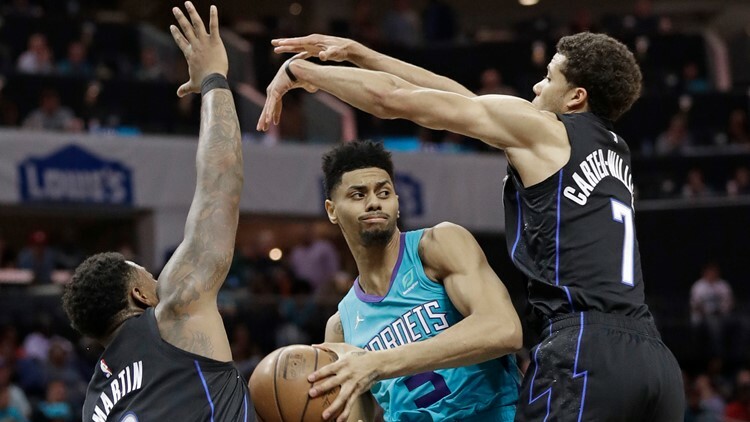 CHARLOTTE, N.C. — (AP) — Kemba Walker scored 43 points in what may be his final game with Charlotte, a 122-114 loss to the Orlando Magic on Wednesday night that eliminated the Hornets from playoff contention on the final day of the regular season. Aside from Walker's sharp shooting, nothing went right for Charlotte. The Knicks, the worst team in the NBA, didn't put up much of a fight, losing by 26 at home to the Pistons. Charlotte had its four-game winning streak snapped by the Magic, led by their former head coach Steve Clifford. If this was his curtain call in Charlotte, Walker certainly left Hornets fans with a memory of what they'll miss. The franchise's leading scorer was 16 of 25 from the field and had five assists. He received a standing ovation and a hug from coach James Borrego as he left with 1:06 remaining. "MVP!" chants for Walker started midway through the fourth quarter after he scored his 39th point, and he spent a few extra minutes on the floor after the game hugging almost everyone before heading to the locker room. Orlando, which clinched a playoff spot earlier this week, shot 54.5 percent from the field and got 18 points from D.J. Augustin. The loss also means Tony Parker's string of 17 straight playoff appearances is over. Parker didn't have a say in the outcome and hasn't played in the team's last 13 games as Borrego elected to go with younger players. Magic: Outscored the Hornets in bench points 51-35. Hornets: Miles Bridges didn't wait long to turn in the play of the game, soaring well above the rim for alley-oop dunk to give Charlotte and early 2-0 lead. Magic: Will face Raptors in the first round of the playoffs.